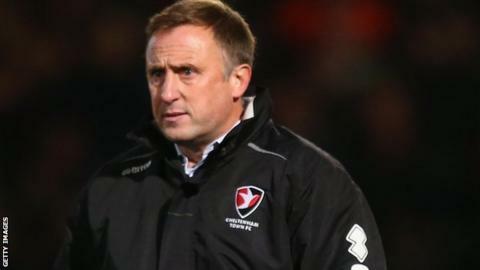 Cheltenham Town manager Mark Yates says the departure of long-term assistant Neil Howarth was not his decision. It was confirmed on Monday that Yates had agreed a new one-year deal with the League Two club, but Howarth would not be kept on beyond this season. "Was I happy about the decision? Far from it," the Robins boss told BBC Radio Gloucestershire. "But if you ask me will I be professional, get on with it and build again? Without a shadow of a doubt." Neil has been a rock for me. It's just a shame we won't be together. The pair were former Cheltenham team-mates and also worked together when Yates was manager at Kidderminster. They both returned to Whaddon Road when he was appointed manager in 2009. Together they have twice guided the Robins to the play-offs, although they can finish no higher than 11th this season. "I've been working with Neil for eight-and-a-half years and he's been brilliant for me and this club," added 45-year-old Yates. "Neil has been a rock for me. It's just a shame we won't be together. However, we both know that that's football. "I'd like to thank him and wish him well for whatever he does in the future." Yates is the third longest-serving manager in the top four divisions of English football after five seasons at Cheltenham. Only Arsenal boss Arsene Wenger and Exeter's Paul Tisdale have had longer in charge.